“Becoming a Writer” Tailored to all grades from K-8. An ideal foundation for later writing workshops, this assembly consists of a reading, followed by a discussion of the process of writing, illustrating, and being published. Using many visual aids, Amy dwells on some of the pleasures as well as the pitfalls of writing (with special emphasis on the need revise). Includes a Q & A session. These mini writing workshops can accommodate two-to-three classes at a time.They include a Q. and A. follow-up to the assembly. Amy then teaches the students the rudiments of writing a story or piece of non-fiction, depending on grade level. Though most large groups don’t complete the story in the workshop itself, teachers are given enough information to complete the writing afterwards. Students create their own stories (see Writing Workshops, below). By meeting in a single classroom, students receive more individual attention and complete much of the story, under Amy’s guidance. For a more in-depth writing experience, Amy can meet with 4-5 classes a day over a space of three or more days, each one devoted to planning, writing, and revising a story. 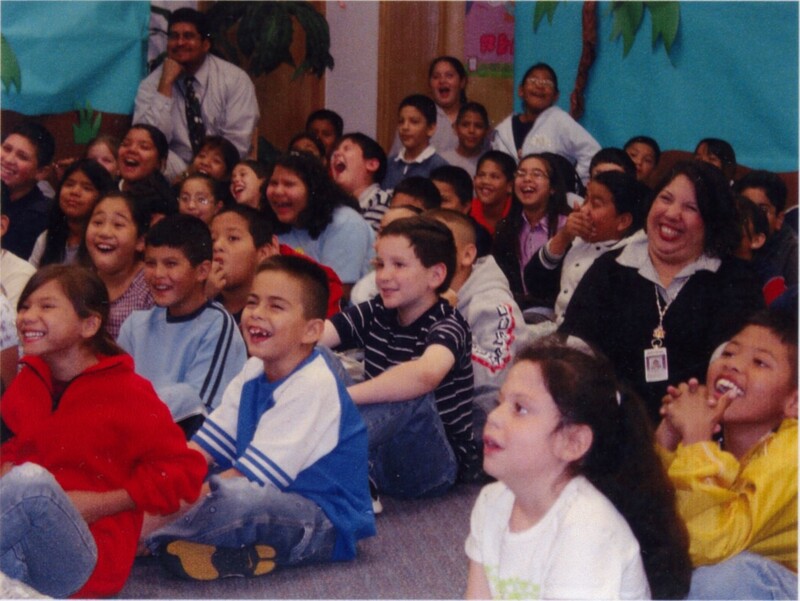 “Partners in Education” National Touring Program. Developed in conjunction with the Kennedy Ctr., the Professional Development workshops train teachers to give Amy’s arts-integrated classroom workshops as well as focusing on the principles of teaching good writing. Some info is available on her page in the Kennedy Center’s brochure. For complete offerings, visit her Professional Development page. Each school visit involves a daytime book signing. Additional family evenings may be scheduled. We write a “Big Book” together with emphasis on rhyme, which aids reading as well as writing skills through phonemic awareness. A fun look at the sources of creativity, which includes a quick writing exercise that helps children come up with new ideas for stories. Can be done with unlimited numbers, iindividual classroom, or as part of assembly. Using Rachel Fister’s Blister for inspiration, students brainstorm to produce a finished story together, using a method that helps reluctant writers participate, and teaches all involved to recognize the elements of a story, overcome common obstacles to writing (getting started, getting stuck, finishing it), and how to tackle revision. Gr. 3-6 “The Seuss-inator” Need a new angle for Dr. Seuss’s birthday? As a Seuss fan and author of a half dozen rhyming books, Amy has developed a special “Dr. Seussinator” mini-writing workshop for grades 3-6. This workshop explores Seuss’s techniques and helps student write their own version of a Seuss favorite. This workshop takes the difficult and abstract topic of diversity and tolerance and helps students find ways to express themselves on the topic by creating a few short, powerful quotes on the subject. These quotes can be combined with other efforts (using artwork, for example) to celebrate diversity and discourage bullying in a school system. Writing a short, impactful quote is basically the same thing as writing a poem. It requires the writer to take a complex, abstract, idea and reduce it to a few words. The workshop provides students with 9 writing tools used in both poetry and persuasive writing. Grades 5-12 Persuasive Writing This workshop is a playful yet serious look at ways we are manipulated – and can learn to manipulate others – with language, in various media: politics, advertising, and even in fiction. Applicable across the curriculum. Adaptable for lower grades as well. How do you create a trickster tale? What are some of the basic elements of this universal story form? We create the framework for such a story, using Please Malese! as an example. This workshop is aimed at both beginners and more advanced writers, with special emphasis on the difficult Introduction and Conclusion.. As with all my workshops, the tools come from my personal “writer’s toolbox”: my own essays and non-fiction have been published everywhere from The Times of London to the New Yorker magazine. Not available as a large-group workshop. Teacher In-service & Professional Development options here. Four/day (five, if kindergarten is included). A mixture of a school-wide assembly and classroom visits reaches the maximum number of children. Each visit includes a mini-writing exercise. Unlimited for assemblies, family evenings, and classroom visits. 50 for large-group writing workshops. 25 for small-group writing workshops. Each school visit can accommodate a book signing during or immediately following the school day. Books are available directly from the author; or in some cases from the publisher or a local bookstore. I am going to contact you directly by email with that information.